My first introduction to the music of Hans Gál (1890-1987) was the Cello Concerto (opus 67) played by Joan Dickson*, a work of unfashionably lovely melodic beauty. Thereafter, living in the south side of Edinburgh, I used to encounter Gál at the bus stop on his way into town, when he would be abstractedly humming to himself! Melody indeed, together with an aristocratic contrapuntal intellect, mark all the music of this gentle, shamefully neglected, musician and musicologist, author of definitive studies of Brahms and Schubert. Our ignorance is perhaps understandable since his life in music, culminating in his decade of directorship of the Mainz Conservatoire was sadly brought to an end in 1938 by the advent of the Nazi regime, and his dismissal on account of his Jewish nationality. Aiming then for America he was, by good fortune, diverted to Edinburgh on the personal invitation of Professor Tovey. Initially his brief was to organise the extensive library of the Reid music school at the University - but his ultimate involvement as lecturer and participation in the active musical life of the University and the City filled his last fifty years@ with a fresh stimulus to create. This was a period which produced a large number of chamber and instrumental compositions before his retiral at the age of eighty-eight. As a consequence of this we know of, but have never heard, (nor are likely to hear) his several operas (all published and performed in the days when German opera companies had their own theatres and resident orchestras), nor his four Symphonies. Apart from a nostalgic backward glance at opus 3 - the six Serbian Dances (") the works on this disc are from these Edinburgh years. Even in the early Dances the mood is one of quietly enjoyable humour, expressed with impeccable musicianship. 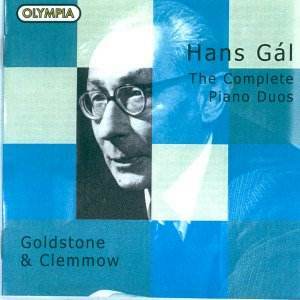 In his youth he played orchestral works in duet form with his sisters, the only true way to learn and understand music - and it is appropriate that this CD, the first appearance on disc in this country of his music& should be in Piano Duo form, with its element of sharing the pleasure of the music. The opening 'Three Marionettes' are a delightful compendium of elegant counterpoint, playable by the reasonably competent amateur, and a perfect introduction to his music. The Concertino is also a light-hearted work whose central Siciliano's hypnotic geniality is followed by a contrapuntally dextrous fugal movement. (The last work he ever wrote was 24 Fugues for piano). The three Impromptus are �fun' pieces, written for the Saturday entertainments of 'Willie McNaughton and Johnnie McGregor', in which Gál himself must have participated! The final Pastoral Tune for six hands provides the Duo with a reason (in the sleeve notes) to recount the delightful incident when Clifford Curzon joined Gál, and Gál�s ten-year-old daughter, Eva, in this work. Curzon seemingly had difficulty counting his treble part, prompting the young Eva to scold "I don't have to count!". This is a thoroughly enjoyable disc and must undoubtedly prompt a demand for more. I would select the three Sonatinas for Violin and piano, and the Piano Sonatinas - 24 Preludes - And there is a vast range of chamber music! (*) Moray Welsh later broadcast this work. (@) Apart from an unnecessary period of internment as an alien.